Welcome to the first week of the Down Memory Lane Quilt-Along! I am so excited to be piecing this quilt along with you. 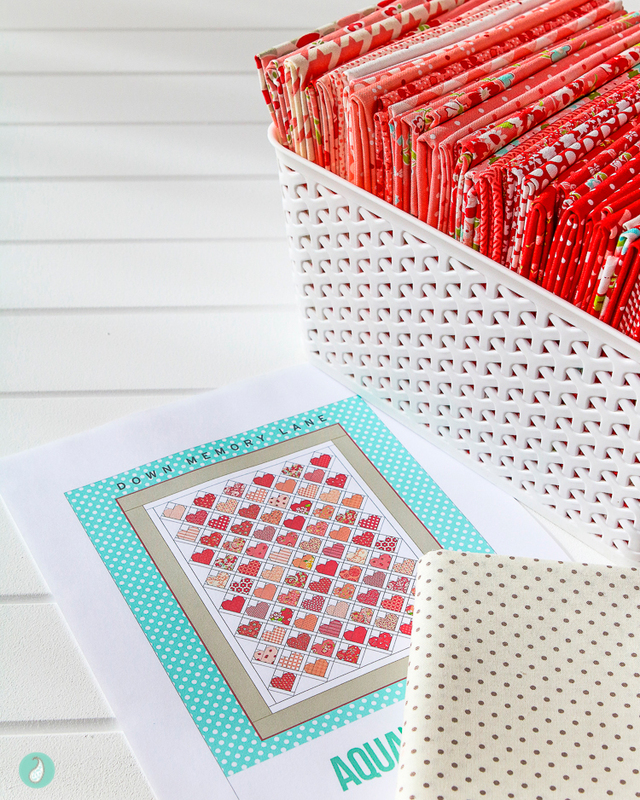 For my version of this pattern I am using a scrappy bundle of Bonnie & Camille reds and pinks. For the background I have chosen a simple polka dot fabric. 1. Invest in the right tools for the job. To some this will be obvious, but if you are new to patchwork and quilting then it might not seem important. BUT IT IS!! Quality tools do make a difference to the outcome of your project. 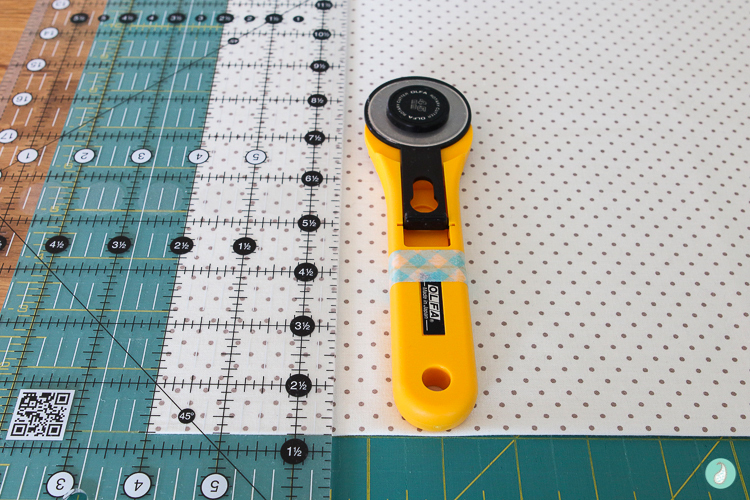 A rotary cutter with a sharp blade, a quality self-healing cutting mat, and acrylic rulers designed for quilters are essential tools for any patchwork project. An Olfa 45mm rotary cutter. I always keep at least one replacement blade on hand and change the blade after every couple of projects. If I know my project calls for a lot of trimming, I will invest in a new blade to make the process less stressful on my hands. An Olfa self-healing cutting mat. Purchase the biggest mat you have space for to ensure you can cut large pieces if the need arises. A small Fiskars rotating mat. The surface of the Fiskars mat feels quite different to the Olfa mat and takes a little bit of getting used to. However, in conjunction with a sharp blade it ensures a clean cut when trimming back small fabric pieces. It is easy to manipulate and turn without being too easy to turn (and running the risk of the mat accidentally rotating while trimming). Creative Grids rulers. These rulers are my current favourites. They rarely slip when you are using them thanks to the unique surface on the base of the ruler that grips the fabric and keeps the ruler in place. They are ‘mostly’ easy to read, and they provide accurate pieces when using the guidelines. Not essential, but something else I have been using a lot lately is a portable book light. Good lighting is a must when cutting, but it is not always available when cutting at night. I find this light can be easily positioned to reduce shadows and is a great tool to have nearby. This particular light is a USB rechargable Raniaco LED reading light, – I purchased mine through Amazon. 2. All fabric needs to be ironed to remove any creases prior to cutting. Don’t be tempted to skip this step as wrinkled fabric will lead to inaccurate pieces. 3. Never cut more than 2 pieces of fabric at the same time. If cutting strips across the width of the fabric, fold the fabric in half aligning the selvedge edges towards the top of the mat. Be sure the bottom fold aligns with a horizontal line on the lower end of your cutting mat close to you. If you are right-handed (like me), the leading edge of the fabric to be trimmed will be on the left side of your cutting mat, and vice versa if you are left-handed. Trim the fabric to align the edges and create a 90 degree corner at the fold prior to cutting your strips. Once the edges are square you can begin to cut the requisite number of strips by sliding the ruler over and measuring the required width with you ruler. You may find it necessary to realign the bottom horizontal edge and trim the leading edge every few inches throughout the strip cutting process. Always aim to trim away the minimum necessary from the side so you don’t waste precious fabric. However, if you are required to cut an even number of pieces per strip, you may be able to ignore the folded portion of the fabric entirely. Generally when this is an option I will cut the strip width, then trim the top selvedges, and then proceed to sub-cut my pieces from this end, discarding the bottom folded edge. 4. Use a consistent brand of acrylic ruler. a 7-1/2″ square for the trimming. 5. 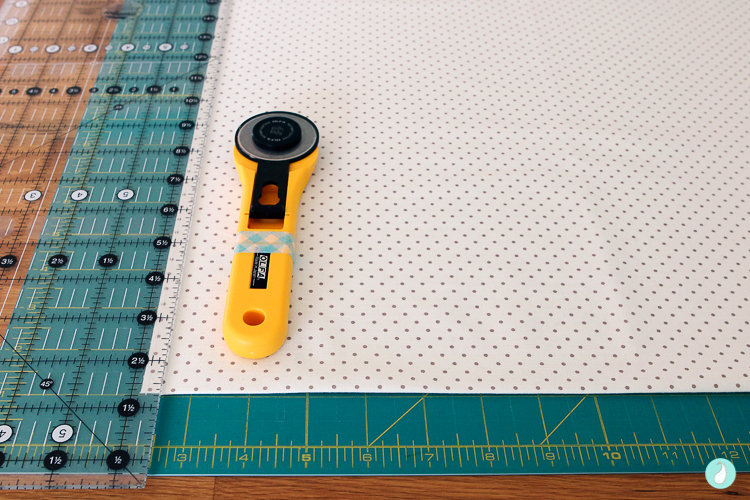 Place the line on your ruler on top of the edge of the fabric piece being cut. We often discuss the need for a scant 1/4″ seam allowance, but we rarely discuss the importance of ensuring your cutting is NOT scant. When using your ruler, place the measuring line on top of the fabric edge (rather than aligned next to it). It is also better to use only your ruler to measure the cut pieces, rather than your cutting mat. A combination of the two will not yield a consistent measurement. And, using the cutting mat alone will prove inconsistent as the mat ages and the lines distort through regular cutting. 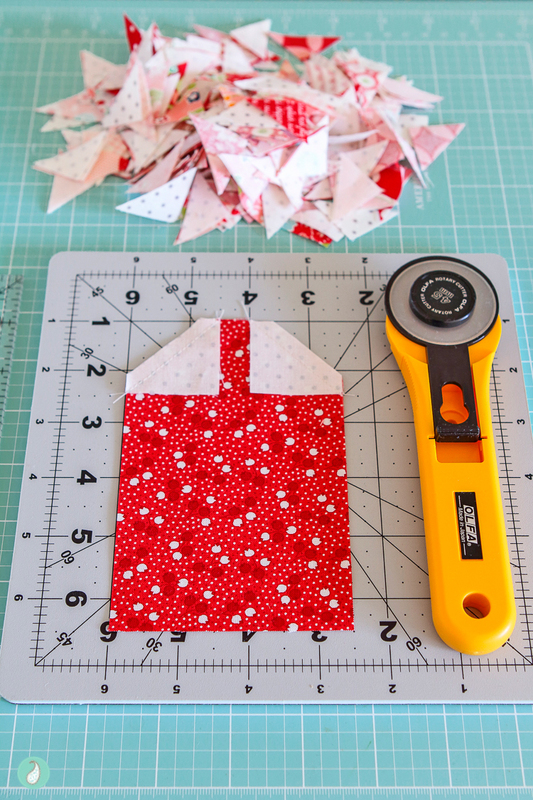 There are two specific notes in the cutting instructions – please read them so you understand the best way to cut your fabric, and why you will have an extra block at the end of the piecing process. 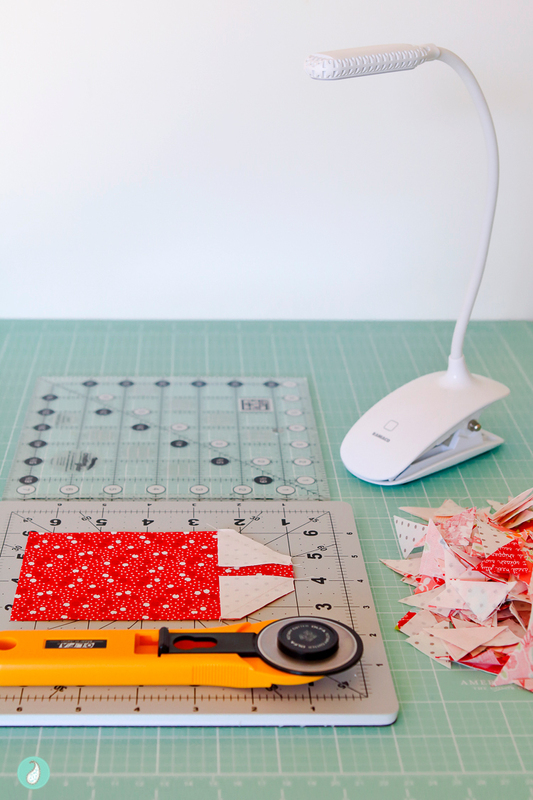 When cutting tiny pieces for any mini quilt you need to take extra care to ensure the pieces are accurate. If you have difficulty handling small pieces you may wish to apply starch to your fabric prior to cutting. This will stiffen the fabric slightly and provide extra stability while handling the pieces. 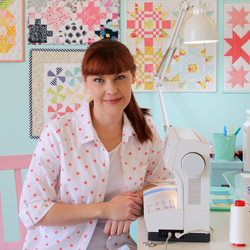 Purchase your pattern now, and join the Facebook group to connect and share your quilt making progress with others in our community. If you have a specific tip related to cutting, I would love to hear about it – leave me a comment and let me know. This is great info tatis rarely included in beginner quilting articles. I wish I had known all this when I started. Thank you!